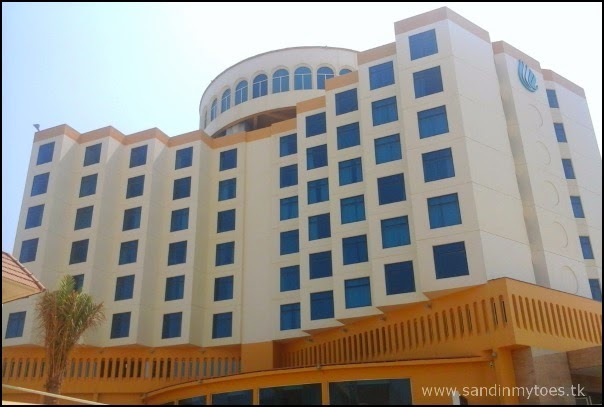 While Dubai is certainly the crown jewel of the United Arab Emirates, there are many towns and cities in the country which have some of the most picturesque locations, such as Al Ain, which we visited last year. Khorfakkan is a small town, and part of the city of Sharjah, although geographically separated from it. The name Khorfakkan means Creek of the two jaws and is so named because it has two headlands on either side. I remember visiting this beautiful place as a child, and in my memory, I can recall playing at the foot of the rocky mountains! 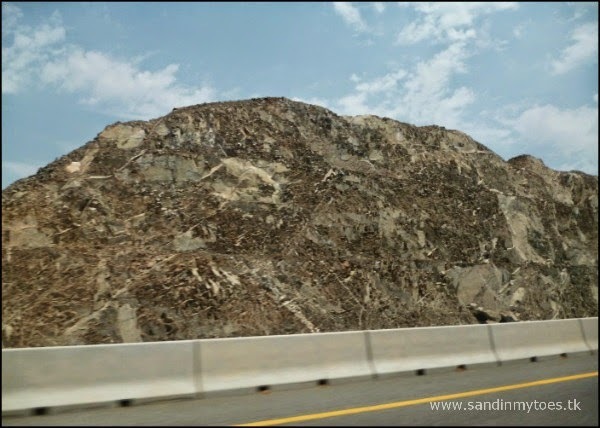 They are actually the Hajar mountains (meaning stone mountains) that are found in the eastern coast of UAE and parts of Oman. It was a pleasure to visit Khorfakkan last weekend, when we took off on a 90-minute road trip to the Oceanic Khorfakkan Resort and Spa, where we were to stay overnight. 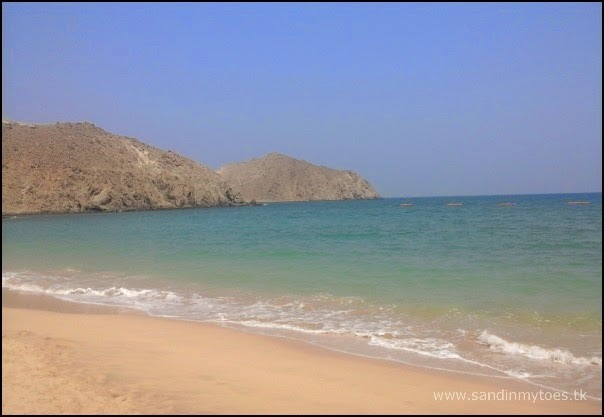 To reach Khorfakkan, you have to take the Fujairah highway, which is a very comfortable and scenic drive. The landscape transitioned from the desert, to sandy mountains, to the rocky mountains that announced our arrival on the North East coast. 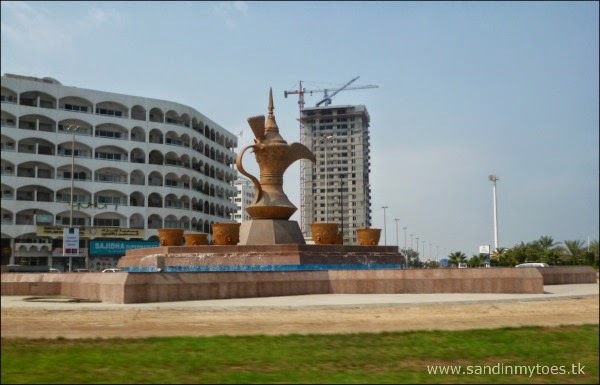 The city of Fujairah that we passed en route is also an interesting city to explore, and one that I hope to return to some time. Oceanic Khorfakkan Resort and Spa was refurbished last year, and by the looks of it, promised a weekend of sun, sand, and luxury. The staff at the resort were efficient and friendly, and our check-in was quick, even though it was the start of another busy weekend for them. ...and the Hajar Mountains on the other. We were welcomed with a personal note by the manager, complimentary dates, and a bowl of fresh fruit. It was just what we needed after a drive on a hot day! Of course, we couldn't wait to get to the beautiful beach that beckoned us below. The wind was getting cool as evening was approaching, and the private beach was clean and flawless. 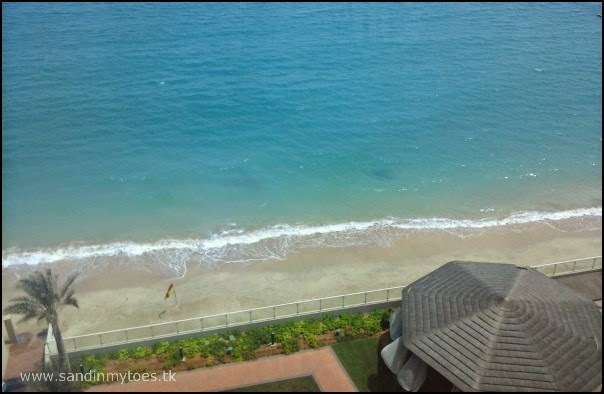 We spent our time at the beach lazing around and swimming in the cool waters, but the Diving Center at the resort also offers water sports like para-sailing, jet skiing, and snorkeling. Little Dude is actually fond of swimming in the pool more than the beach. I guess he doesn't like the waves splashing on him! So I took him to the kids pool. The pools are just next to the beach, so the view is splendid. The pool area was nice and relaxing, with plenty of sunshine and clean, air conditioned changing rooms. We got out of the pool just in time to change and head for Movie Night in the Al Diwan Tea Lounge. 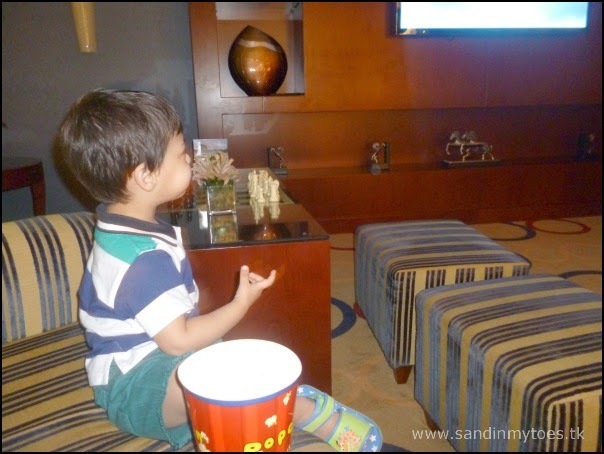 Finding Nemo was playing, one of my favourites, and Little Dude sat at least for a part of the movie, munching on popcorn! The dining options in Oceanic Khorfakkan Resort and Spa are many. 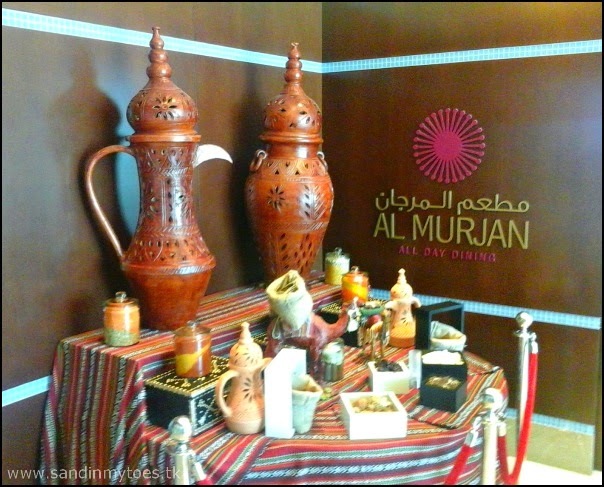 Al Murjan is the main restaurant with all day dining options. We had our meals there, and the buffet was everything you would expect from a good restaurant. There were a variety of cuisines, a good selection of salads, and dessert. 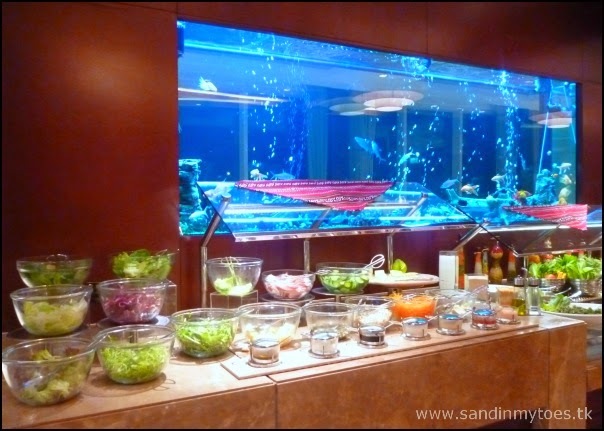 There was a live cooking station at all meal times serving dishes like pasta, steak, shawarma, omelettes, and waffles. Al Murjan has a panoramic view of the beach and the resort, so it was a pleasant ambiance to dine in. The resort also has a newly opened cafe called Breakers right next to the pool, and overlooking the beach. We did treat ourselves to some fresh fruit drinks at Amwaj, the pool bar, and they were perfect drinks for a day under the sun! 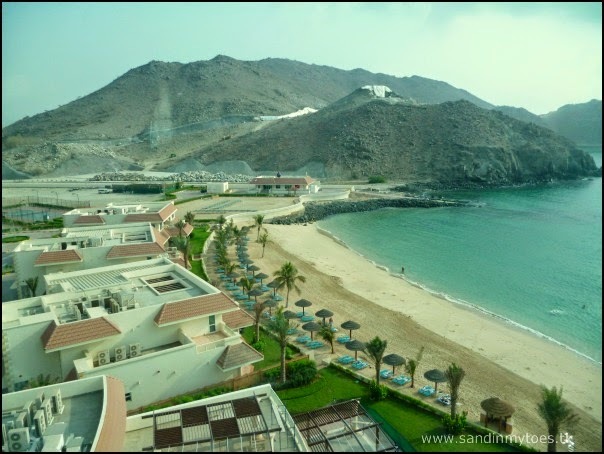 What we loved about our stay at Oceanic Khorfakkan Resort and Spa is that it is very family-friendly. The staff are helpful, and children are welcome everywhere! I did wish that there was some sort of indoor play space for kids, and am glad that they are going to start a Kids Club soon for activities geared to them. 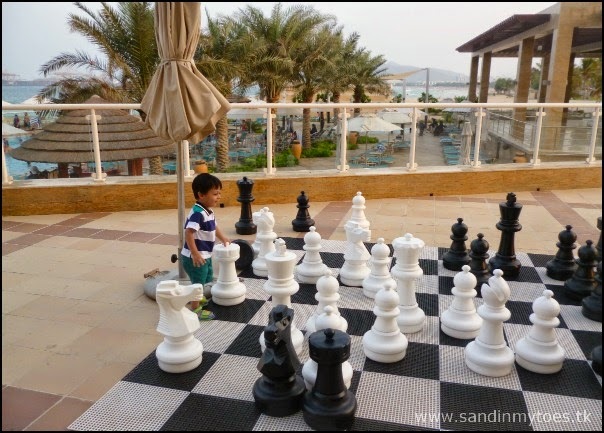 Meanwhile, Little Dude was happy exploring the place and general, and checking out the giant chess board. Another good thing about the resort is that it is light on the budget, which is great for families looking for a weekend retreat. There is free WiFi access, a boon for a social media addict like me! They also have the 360 Health Club and Spa to help you unwind, and I was lucky enough to experience it too. Watch out for my review in another post. If you would like to indulge in luxury, I was given a tour of their villas and villets. They range from one bedroom suites to five bedroom villas, and are they just awesome! With a private terrace, they give you direct access to the beach. The terrace even has a barbecue station and deck with a breathtaking view. Suites have kitchenettes, dining areas, and jacuzzis. If you can afford it, these villas are perfect for a beach vacation you'd never forget. 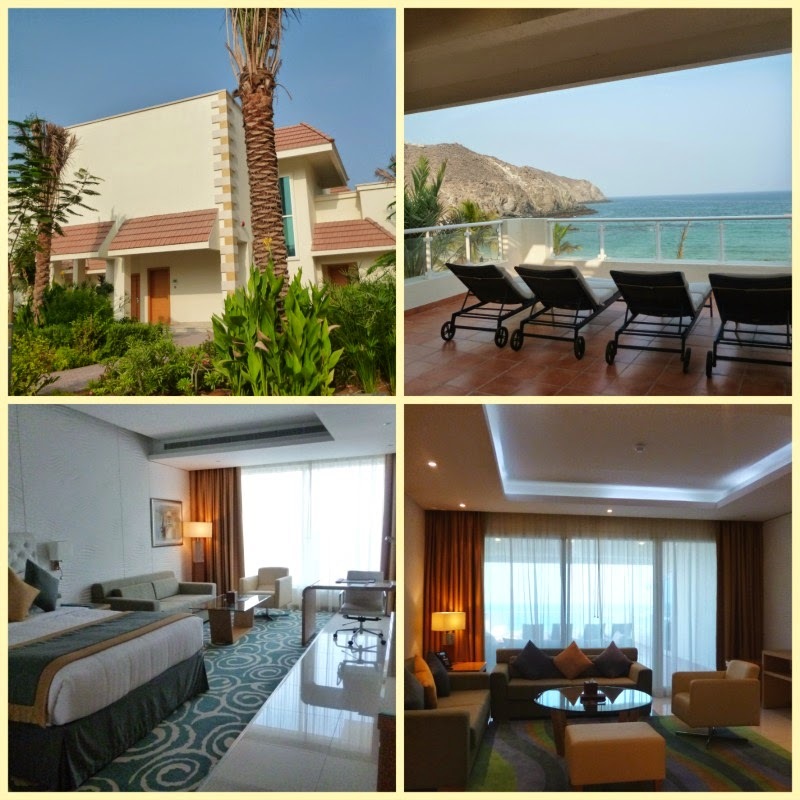 Our verdict is that Oceanic Khorfakkan Resort and Spa is just the place to spend a staycation or if you are visiting the UAE, and planning a weekend getaway. Affordable, yet luxurious, this is a great spot for families. Right next door is the Corniche where you can go out for a stroll, and just opposite is a park and playground for children. I think you couldn't ask for anything more in a beach resort, We definitely had a memorable weekend and would love to head back soon! For more information, or to make a booking, you can contact Oceanic Khorfakkan Resort and Spa on +971-(0)9-2385111, or visit their website. We were guests at this resort, but all views and opinions are my own. Yes, it was a memorable weekend for sure! If you ever visit this country, I'd recommend spending a day or two here!